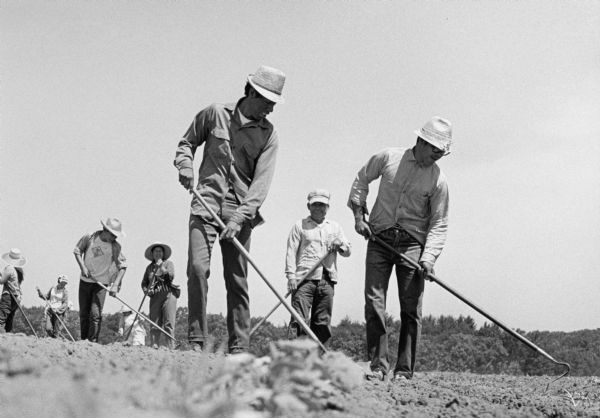 The "Struggle for Farmworker Justice" gallery consists of 96 photographs taken between 1966 and 1971 by Wisconsin-born photojournalist David Giffey. Giffey captured details of migrant worker life in Wisconsin and Texas, revealing intimate details of people's living and working conditions. 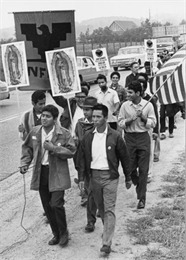 His images also document the solidarity between Wisconsin residents sympathetic to the United Farm Workers' grape boycott started by Cesar Chavez and Wisconsin labor union organizers such as Jesús Salas and Salvador Sanchez. Giffey took the photographs with a second-hand 1950s Nikon S2 rangefinder camera. He used the "push-processing" method to accommodate any underexposed Kodak Tri X Pan film negatives. When photographing indoors, he did not use flash attachments. Since 1961 David Giffey has worked as a staff writer, photojournalist and freelance correspondent for a variety of newspapers, magazines, and radio news outlets. His professional career began in 1965-66 in Vietnam, where he was a combat journalist for The American Traveler, a U.S. Army newspaper. Prior to that he had been a wire editor for the Oshkosh Daily Northwestern and an assistant editor at the Fort Riley Post. When he returned to Wisconsin, Giffey became involved with Obreros Unidos (United Workers) and the migrant farm worker labor movement. He says his approach to photography and journalism was "specifically intended to advance the cause of farm workers." His philosophical and political interests drew him not only toward the farm worker movement but also alternative media and the peace movement. After three decades of activism, Giffey created a traveling exhibit in 1998 called "Struggle for Justice: The Migrant Farm Worker Labor Movement in Wisconsin." It included black-and-white photographs, Spanish and English text blocks, and supplementary information such as maps and news stories. Two years later he edited another of his photographic collections, "The People's Stories of South Madison." David Giffey was born December 20, 1941, in Fond du Lac. He grew up on a small dairy farm and attended a one-room schoolhouse. While working as a young man in nearby corn and peas canning factories, he became acquainted with migrant workers from Texas, Mexico, the South, Jamaica and Barbados. In 1959, while in college, he befriended members of the Jesús Salas family who had moved to Wisconsin from Texas. At the same time, Giffey became politically active. He worked for John F. Kennedy's 1960 presidential campaign and introduced JFK when the future president came to speak on his college campus. From 1966-1969 Giffey covered congressional and presidential candidates such as Eugene McCarthy, Richard Nixon, George Romney and George Wallace. In addition to photography, Giffey has worked as a visual artist, painter and muralist for churches and public buildings. He was also the founder and instructor for the Boys & Girls Club of Dane County's "Youth Journal" from 2000-2010.